DenLorsTools.com Summary: Tips on how to check an overheated car and we cover some tools that help if first the problem isn’t revealed. 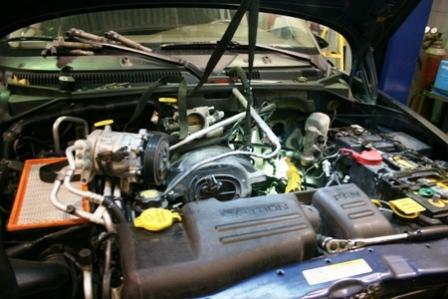 A car motor overheating can cause engine damage pretty quickly. Here we cover the basics on quickly checking for the cause of an overheat. Some tools make the job easier, but many things can be checked without any special tools if you know what to look for. Blown Head Gasket *That’s what can happen if someone keeps driving. A blown head gasket is a common failure that can be prevented if the signs of an overheat are noticed quickly enough and acted upon. A common mistake, because no one wants to be stranded, is to keep driving the car until the destination is reached. Just because the car can be driven when it’s overheating, that doesn’t mean that it should be. Continuing to drive the car with an overheating engine may cause the cylinder head to start to warp. That can allow the head gasket to leak coolant, compression and or exhaust past it. The most obvious and common sign of a blown gasket is a huge cloud of steam and smoke coming out of the tail pipe. 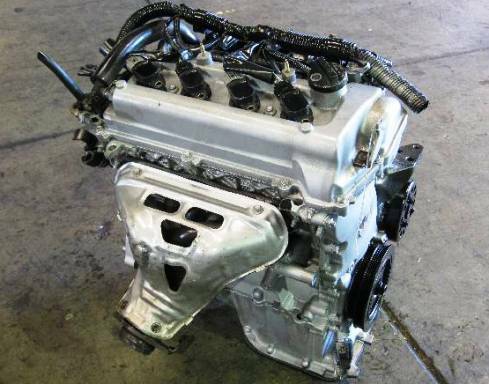 This occurs when the coolant get’s past the head gasket into the combustion chamber and; A. Some coolant get’s burned and B. Some coolant vaporizes and turns into steam. Sometimes smaller head gasket leaks may not be that noticeable at first. That because the catalytic converter reaches such high temperatures that a small amount of coolant can be vaporized and doesn’t show much indication of a problem once it reaches the tailpipe. Below is a checklist to see if there’s a blown head gasket. 1. Check for water in the engine oil. Sometimes the oil will be “over-full” and milky looking if the coolant is ending up in the crankcase. Driving with water in the oil can obviously cause engine damage because of the lack of proper lubrication. 2. Is there a peculiar smell or a puffy white cloud of smog coming out of the tailpipe? Burned coolant can sometimes smell sort of sweet, but can induce a sickening feeling (for the owner). 3. Is there a CEL (Check Engine Light) on? 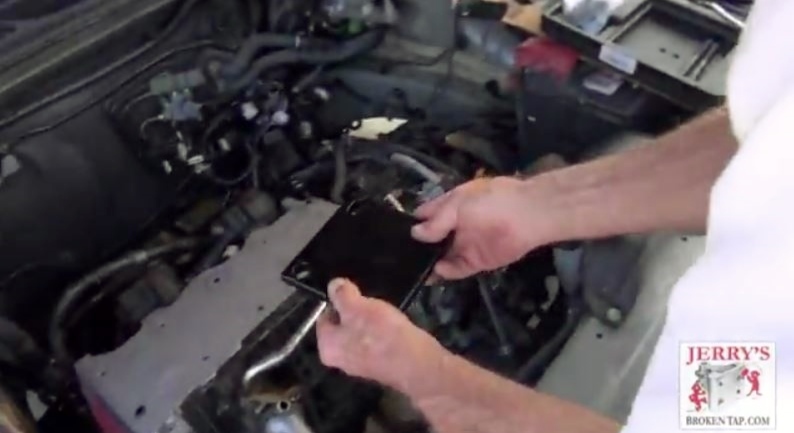 Scanning misfire code with a code reader (or scan tool) alone, doesn’t mean that there is a blown head gasket. However, if water is getting into one or more of the cylinders, it can cause a misfire code (P0300 series). It’s common for a blown head gasket to affect two cylinders that are side by side. 4. Is there exhaust in the cooling system? If the pressure builds up quickly in the cooling system even when the engine is cold, exhaust may be what’s causing the quick buildup of pressure. The exhaust pressure from a blown head gasket can cause too much coolant to make the coolant reservoir/bottle, overflow. Also, if there are constant air bubbles that never seem to bleed out of the system, it could be exhaust, from a blown head gasket. A carbon tester can determine if there’s exhaust in the cooling system. 5. Can’t start the motor after a severe over heat? Coolant can actually fill a cylinder when the engine is turned off. The coolant pressure is relieved when the coolant bleeds into the engine. This causes a hydrolock condition. When trying to start the motor, it will be prevented from turning over when it reaches the affected cylinder (the one that has water in it). That’s because engine pistons are unable to compress fluid. Removing the spark plugs and looking into the cylinders to check for coolant is one way to inspect for this issue and find the problem cylinder. If there’s a trouble code (CEL) like mentioned before, that can help narrow down the search for spark plugs to be removed for cylinder inspection. A blown head gasket is one of the worst and most expensive results of driving a car that has a faulty cooling system. Cracked blocks can also be a problem, although not as common as warped or cracked heads and simply blown head gaskets. Aluminum heads and blocks used commonly today are more susceptible to warping that cast iron than was used primarily in the past. Below are some of the most common signs of problems that can lead to a blown head gasket if ignored. 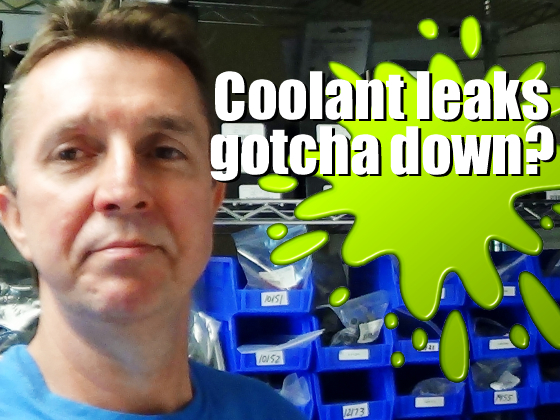 Coolant Low – *Never remove the coolant cap on a HOT engine! 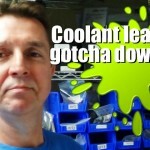 Simply put, coolant is what circulates in the engine and radiator. It transfers heat away from the engine by use of fluid (coolant) that is cooled off in the radiator and returned to the engine to repeat the cycle. If the coolant is low, it obviously cannot do it’s job of cooling the engine effectively. If there is a leak from any component in the cooling system there will be low coolant in the system and it cannot work at 100% efficiency. Below are tips on checking for coolant leaks. 1. Look for puddles underneath the car. Don’t confuse the AC water dripping underneath the car as coolant. The AC condensation water that drips from the evaporator will be clear. I have seen coolant dripping out the AC drain before when a heater core leaks. That fluid is not clear. Not unless plain water is the only thing in the cooling system there’s absolutely no coolant mixed in the cooling system as it should be. 2. Look underneath the hood for obvious signs of a leak. This could be as easy as raising the hood and seeing water spraying from a pinhole in a radiator hose. Or, there might be a small collection of coolant somewhere on top of the motor near the intake manifold. I’ve seen coolant colored corrosion or stains that have led me directly to leaks around hose connections, seams of the radiator, around the water pump weep hole, thermostat housing and many other components. 3. Pressure testing the system is the easiest way to find a leak. By pumping up the coolant pressure tester to 15psi or so, many times coolant will be seen coming out the leaky component. Also listen for air leaking, because if the system has an air pocket or is a little low, the air pressure may be what is found leaking instead of coolant. As far as the correct pressure limit that can be applied; just look on the radiator cap. The pressure is usually listed there. If not I wouldn’t pressure the system above 15 psi when looking for a leak. If the leak is large, no pressure will register on the gauge or it will drop quickly. 4. Smell a sweet or sour smell inside? Could be that Coke that was spilled last week, or it might just be a leaky heater core. If there’s a wet spot on the passenger side carpet, accompanied with a low cooling system and sweetish smell, it’s likely a heater core. The evaporator water from the AC could also be the cause of a wet carpet, from a clogged drain. So be sure it’s coolant and not just plain water from the AC. 5. Find the leak and FIX it. It may sound simple. Don’t just keep adding coolant if you know you have a leak. One of my old bosses, that actually taught me a lot in the beginning of my automotive repair, career made the mistake of just “topping off”. Topping off a cooling system is not usually a bad thing. That’s as long as the problem is taken care of as quickly as possible. And topping off does not become a daily or weekly ritual, instead of fixing the leak. The problem is that sooner or later, we humans become complacent and forget to check the coolant level. Not to mention the leak could get worse all of a sudden. Then one day we look down at the temperature gauge and see the needle on HOT. Then it may be too late, especially if it happens repeatedly. The boss I had a Goodyear many years ago (in the 80’s) had a radiator leak in his Chevy pick up truck. He obviously knew he had the leak. He knew how to do the job. He had our shop available, that he could do the work in after hours. He had different parts stores that we dealt with that he could choose that would give him a good deal on a replacement radiator. However, for whatever reason he chose to continue filling the cooling system until one day the truck overheated and he blew a head gasket. He then had to replace the head gasket and replace the radiator. Cooling Fan *The cooling fan can come on with some models even if the car engine is off. 1. A cooling fan usually comes on only when needed. If the temperature gauge shows more than 1/2 way and the fan is not on, the fan may be the cause of the overheat. I always check for power and ground to the fan. If it’s getting both the fan motor is bad. Sometimes tapping on the motor, may make it work temporarily confirming it is the problem. Relays and fuses should also be checked if there’s no power. If a fuse is blown, the fan motor may be drawing excessive amps. This will most likely cause the fuse to blow again. Use a test light, or better yet a Power Probe to check fuses quickly, test fan motors and relays. 2. Check for obstructions that may be blocking airflow. The cooling fan can only work if there’s airflow allowed. The condenser which is in front of the radiator can become obstructed with bugs, debris, paper or even plastic bags picked up from the highway. It’s a simple thing to, just inspect the front of the condenser to make sure nothing is blocking airflow. 3. Check for fan blade wobble. The electric cooling fan has bearings and sometimes can have excessive movement or wobble. Also check to see if the fan spins freely. I’ve seen fans lock up before. I’ve also seen blades break when a car has been driven in deep water. So make sure the shaft is spinning to. This is not a common problem but is worth mentioning. Thermostat – A thermostat is basically a water valve that can cause a quick overheat condition. It’s a common misconception that thermostats rely upon a spring that expands and contracts depending on the temperature of the coolant. If the spring was relied upon, the opposite effect would actually occur. The spring expanding would close the valve when heated. The truth is that the spring is only a “return” spring. The T-stat actually relies upon a wax that expands when hot, which pushes a plunger. This action, opens the normally closed, when cold, valve. Now, if the spring breaks it can jamb things up, but that’s another matter. The T-stat’s purpose is to restrict flow of coolant, so that the engine can reach the best operating temp quickly. 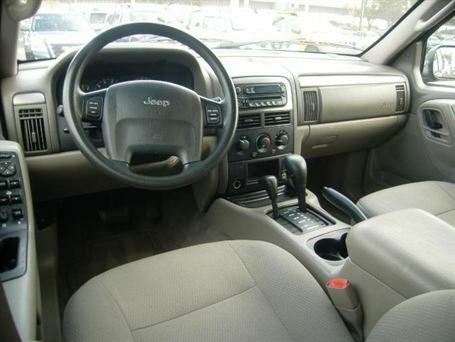 After the engine is warmed up, the thermostat opens to allow coolant flow, so the engine doesn’t get too hot. We have another article covering more on how the thermostat works and Car Heater Troubleshooting. Engine Oil Level *Without enough oil in the engine excess friction causes too much heat. Low oil in an engine is not something that’s usually thought about when checking for overheat problem. But I can tell you, I personally had a car overheat because of low engine oil. After stopping and checking the car over, the only thing I found was that my old 1976 Chrysler Cordoba (that I had a long-long time ago) was low on engine oil. After putting a couple of quarts in, the temperature went down and I went on my way. Final thought on blown head gaskets. While the most common cause of a blown head gasket is overheating; blown head gaskets aren’t always caused by overheating an engine. Sometimes with today’s aluminum blocks, threads for the head bolts can just fail. Due to many heat up and cool down cycles the threads can be weakened. We sell thread repair kits for this precise problem. Our repairs use steel inserts rather than aluminum which is much weaker. The steel has ten times more tensile strength and accept the same TTY (Torque to Yield) bolts that come in so many cars today. Recently, a manufacturer of a stud system that takes the place of TTY bolts was forced to remove a statement on their NorthStar thread repair website because they said that their kit was approved by GM. This obviously was not the case, because they removed that statement. In fact only TIME-SERT is approved by GM for the Cadillac Northstar. 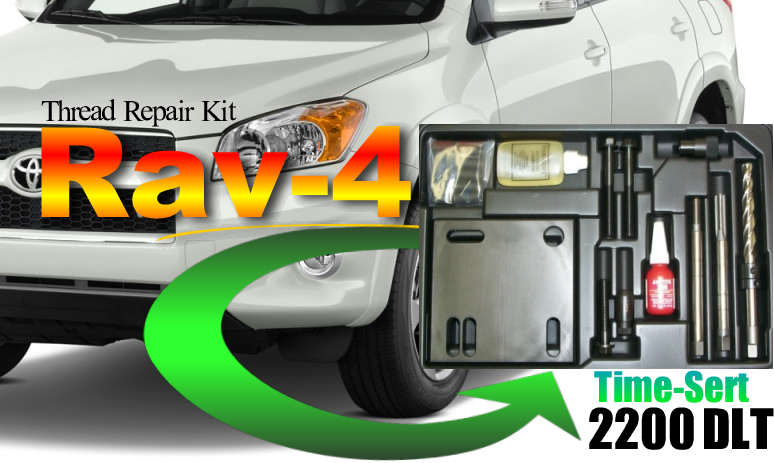 Toyota, Honda and BMW also use a similar TIME-SERT headbolt thread repair kits. Mechanic’s saying. “Pay me now or pay me later.” We all have heard the saying about an ounce of prevention is worth a pound of cure. Well, both these sayings apply. Don’t put off repairing a coolant leak, because a more expensive repair may be the result down the road. My Toyota Corolla 1.6 model 91 is overheating when I drive far. The fan is working and there’s no coolant leak. What could the is problem be? Possibly a restricted radiator. Obviously without looking at it in person this is just one possibility. Maybe have a tech check it in person. Good Luck.